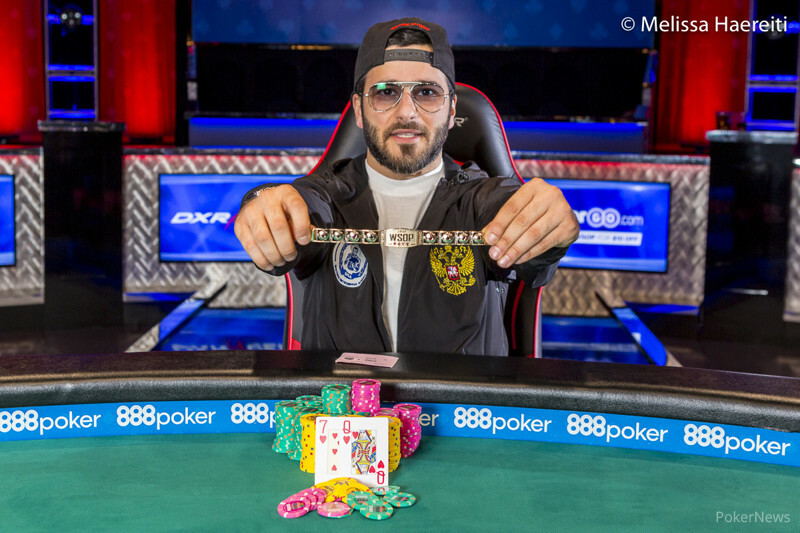 Nadar Kakhmazov took down Event #35: No-Limit Hold'em 6-Handed for $580,338 to win his first bracelet and Russia's third of the 2017 World Series of Poker after Vladimir Shchemelev's victory earlier this week and Igor Kurganov's win as part of the tag-team event. 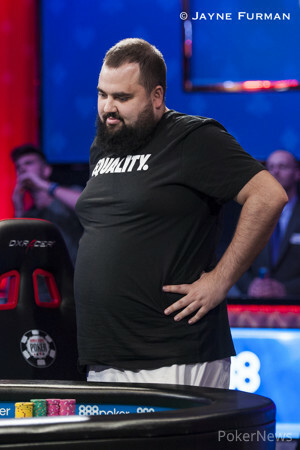 After coming into the day third in chips, he took advantage of other players faltering and stamped his trademark aggression and unreadability on proceedings, taking a huge chip lead into heads-up play, and besting a final table including bracelet winner Sam Soverel, November Niner Kenny Hallaert, and Faraz Jaka. Six-handed play started with Faraz Jaka chip leading, but it didn’t take long for Hunichen to get his chips in the middle in search of a double-up. Eventually, he was called by Jaka, and Hunichen’s pocket jacks held against the overnight chip leader, leaving Jaka in search of a double. Although Jaka was the table short stack, it was Christian Rudolph who was eliminated next when his king-queen failed to overcome the ace-queen of then chip leader Hunichen. Rudolph would take home $79,611 for his sixth-place finish. It was then the turn of Jaka to look for a spot to double up. He got ace-nine in against Kenny Hallaert’s ace-king and, although there was a nine on the flop, there was a king as well, and Jaka failed to find another nine, exiting in fifth place ($112,585). With this elimination, Hallaert closed the gap on Hunichen’s chip lead, and, when Sam Soverel doubled through Hunichen, it was Nadar Kakhmazov who took over the chip lead. 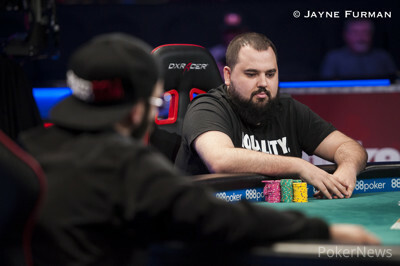 The Russian would grow his chip lead until the elimination of Sam Soverel in fourth place ($162,257). Soverel held pocket sevens against the pocket tens of Hallaert and, with no help on the flop, play was down to three-handed with Hallaert and Hunichen holding fairly equal stacks and Kakhmazov out in front. Kakhmazov had already pushed his lead out further before the elimination of Hallaert. On a deuce-five-four-six board, Kakhmazov moved all in, putting the Belgian at risk. Hallaert eventually called with pocket sevens, but Kakhmazov had a set of fours. There was no help for Hallaert on the river and he exited in third place ($238,855). Heads-up play started with Chris Hunichen doubling through his Russian opponent, but, after some aggressive play, the Russian forged another big lead in chips and finally closed it out for the title, WSOP bracelet, and nearly $600K in prize money. "I am very happy," said Kakhmazov after his victory. "I have wanted to do this for three years but every time I lose two big pots deep in the tournament. I like it. I’m happy." This has been a great summer for Kakhmazov, having taken down an event at the Venetian earlier this month for $440,029 and now his success here at the World Series. "I try all the time to play better and better," he said. "It’s great for Russian poker. "I'm going to play the 10K 6-Max now, and then the 25K PLO, the Main Event. I’m feeling too good!" Hand #114: Chris Hunichen raised to 225,000 and Nadar Kakhmazov called. The flop was and Kakhmazov check-raised a bet of 225,000 from Hunichen to 650,000. Hunichen called. The turn was the . Kakhmazov checked and Hunichen bet 975,000. Kakhmazov moved all in for 8,990,000 and Hunichen asked for a count. "Why you want count?" said Kakhmazov. "I have more than you." "Want to know what I have?" continued Kakhmazov. "You will know in 30 minutes." "Or right now," replied Hunichen, who had 2,690,000 behind. "Right now is better," said Kakhmazov. "If you fold and show, I will show you." The river was the and, after the floor briefly announced that it was a chop pot, they soon realised that Kakhmazov's played, which meant Hunichen was eliminated in second place for $358,677. Hand #113: Nadar Kakhmazov limped and Chris Hunichen raised to 350,000. Kakhmazov called. The flop was and Hunichen bet 320,000. Kakhmazov folded. Hand #108: Chris Hunichen raised to 225,000. Nadar Kakhmazov three-bet to 800,000. Hunichen folded. Hand #109: Kakhmazov raised to 225,000. Hunichen three-bet to 675,000. Kakhmazov folded. Hand #110: Hunichen raised to 225,000. Kakhmazov called. The flop was . Kakhmazov checked and Hunichen bet 250,000. Kakhmazov called. Kakhmazov checked the on the turn and the river came the . Kakhmazov bet 760,000. Hunichen folded. Hand #111: Kakhmazov raised to 225,000. Hunichen called. The flop was . Hunichen checked and Kakhmazov bet 200,000. Hunichen folded. Hand #112: Chris Hunichen limped and Nadar Kakhmazov checked. The flop was . Kakhmazov check-called a bet of 100,000 from Hunichen. The turn was the . Both players checked. The river was the . Kakhmazov bet 200,000. Hunichen raised to 625,000. "Too fast," said Kakhmazov, "Your raise." The Russian called and Hunichen showed him . Kakhmazov showed and took down the pot. Hand #104: Chris Hunichen raised to 200,000 and Nadar Kakhmazov folded. Hand #105: Kakhmazov raised the button and Hunichen folded. Hand #106: Hunichen raised to 225,000 and Kakhmazov called as the flop landed and both players checked. The turn landed the and Kakhmazov bet 250,000 with Hunichen calling. The river landed the and both players checked. Kakhmazov tabled his and won the pot. Hand #107: Kakhmazov raised to 225,000 and Chris Hunichen called. The flop landed the and Hunichen check-called 200,000 as the turn lande the . Hunichen checked, Kakhmazov bet 400,000, and Hunichen folded. Hand #102: Chris Hunichen raised to 250,000. Nadar Kakhmazov called. Kakhmazov checked the flop and Hunichen bet 175,000. Kakhmazov called. The turn was the and both players checked. The river was the and both players checked. Kakhmazov showed and took down the pot. Hand #103: Kakhmazov raised to 225,000. Hunichen three-bet to 700,000. Kakhmazov called. The flop was . Both players checked. The turn was the . Hunichen bet 800,000 and Kakhmazov called. The river was the . Hunichen moved all in for 1,830,000. Kakhmazov called. Hunichen showed for a set of nines and Kakhmazov showed . Hunichen doubled up. Hand #96: Chris Hunichen raised to 225,000. Nadar Kakhmazov called. The flop came and Kakhmazov checked to Hunichen who bet 250,000. Kakhmazov folded. 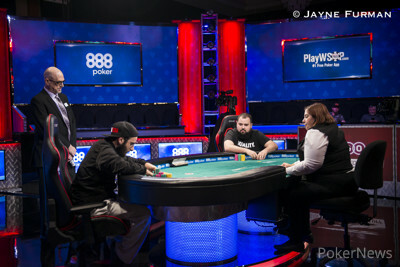 Hand #97: Kakhmazov raised to 225,000 and Hunichen three-bet to 800,000. Kakhmazov folded. Hand #98: Hunichen raised to 250,000. Kakhmazov called. The flop was . Both players checked. The turn was the . Both players checked. The river was the . Kakhmazov bet 300,000. Hunichen folded. Hand #99: Kakhmazov raised to 250,000 and Hunichen folded. Hand #100: Hunichen limped and Kakhmazov raised to 300,000. Hunichen called. The flop was and Kakhmazov bet 400,000. Hunichen folded. Hand #101: Kakhmazov raised to 225,000. Hunichen folded.